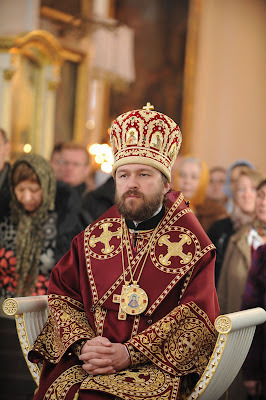 (mospat.ru) - This interview of His Eminence Metropolitan of Volokolamsk Hilarion was given to the Greek journalist Peggy Dokou – (For local TV Channel OMEGA in Rhodes). Here, in Rhodes currently there is an Orthodox – Catholic Forum which brings together participants from all European Orthodox Churches as well as from various Churches and Organizations in Europe. The idea of the creation of this Forum initially belongs to Cardinal Erdö of Budapest and to me. The idea is that we should informally discuss various questions of common interest. The first Forum, which took place in Trento (Italy) two years ago, discussed family issues such as marriage, procreation, abortion, the value of human life and so on. This meeting is dedicated to the relations between the church and the state in various European countries. Sounds far more useful and productive an endevor than the group Met. Zizoulis and Card. Kaspar are leading.